One evening last April, we went out for Indian food with another couple. I sat across the table from Michael McLemore, who is a nurse and software engineer. In an odd (but not unusual) Nashville coincidence, we have each worked professionally with the other’s spouse. So we’ve known of each other for years, but hadn’t really spent time together before. Michael is also a musician, and has played in rock bands for about twenty years, including several bands that have performed around Nashville. These days he primarily plays bass guitar; he also plays guitar, keyboards, and is very interested in and ingenious at figuring out anything to do with sound design, recording, mixing, etc. He’s a brilliant, generous guy. That night over pakoras and curries (and beers), Michael asked me if I’d be interested in putting together a band to play some Pink Floyd songs, with the goal of performing a set at a local club. I didn’t have to think about it at all. I’ve been a classical musician for pretty much all my life, but I also grew up in the 1970s. As a teenager, my record collection mostly consisted of albums by bands that today would be considered “classic” or “progressive” British Invasion rock: The Beatles, Pink Floyd, Queen, Yes, Genesis, Mike Oldfield, King Crimson, Jethro Tull, ELO, Led Zeppelin, and many others. These bands and their music made a huge impression on me, and had a lot to do with the career path I followed. When I was in high school I played keyboards with a number of rock bands that played covers of popular songs, and continued to do this until I was 20 years old. By then (the mid-1980s) I had become more interested in playing jazz than rock and increasingly more serious about my classical piano studies. 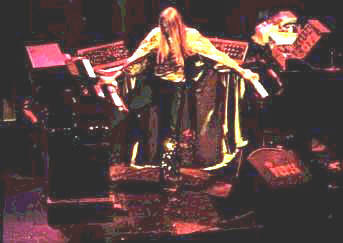 My last gig as a rock’n’roll keyboard player was in a production of Jesus Christ Superstar when I was a college student. 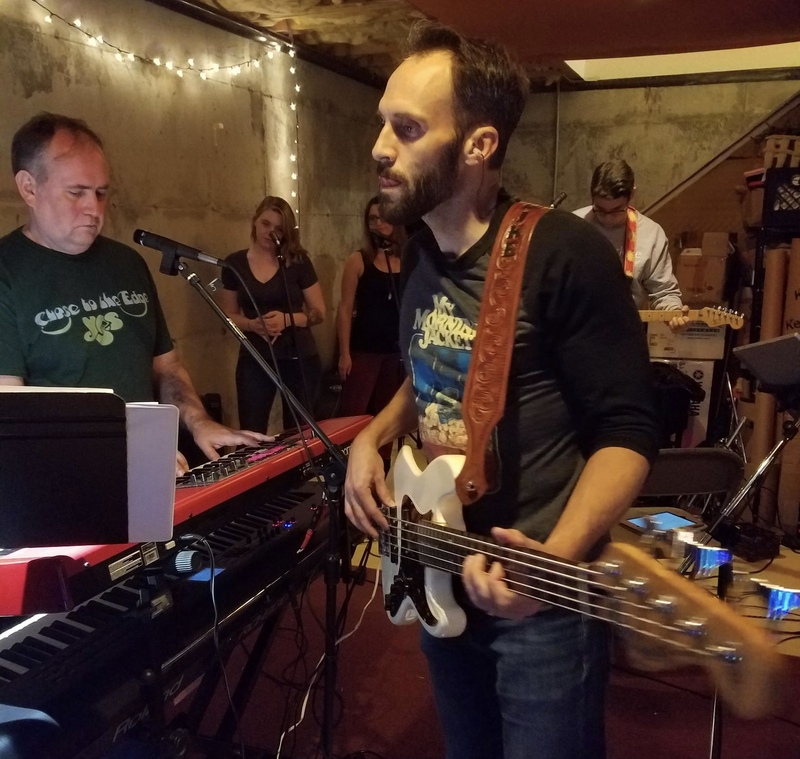 Michael McLemore at The Forest rehearsal in the rock’n’roll basement, October 21, 2018. When I think of Michael in rehearsals last year, this is how I remember him: quietly focused and constantly managing several things at once. Michael and I began meeting in May to brainstorm about how we would pull off the project. Putting together a band to play some Pink Floyd songs is one thing: performing The Dark Side of the Moon is another thing entirely. Our minds were captured by the scope of it, as we began to realize the complexity and attention to detail that would be required to present a satisfying performance. We chose Halloween for the date of our debut: it was far enough away (six months) to give us time to actually accomplish it, yet close enough to inspire us to get to work, and had an added psychological bonus of seeming an especially appropriate occasion for a performance of DSOTM. The Forest, September 14, 2018 (l to r) Alex, Kate, Danesa, WB, Eric, Michael, Andrew. We decided to name our band The Forest, which implies a collection of individuals, who together become something that is more than just the sum of its parts. To call The Forest a “band” doesn’t seem quite right, although in the most obvious sense that’s exactly what we are. The idea behind the group is “project-based”, and the individuals involved might vary depending on the particular project we’re doing. The Dark Side of the Moon was our first project, and it proved that the model can be successful. Graham Mote & Nettie Kraft, The Barbershop Theater, August 17, 2018. We were incredibly fortunate in that early on – in late April or early May – my friend Graham Mote, whom I had told about the project, offered the use of The Barbershop Theater, a small local venue that Graham and his wife Nettie had started earlier in the spring. I met Graham the week I moved to Nashville in 2003 – our sons were in the same class at school – and Graham and I have collaborated before, most notably on Music City Youth Orchestra (he was our board president for several years when we were getting it off the ground, but that’s another story). We’ve been friends for fifteen years, watched our children grow up and leave home, commiserated innumerable times over the difficulties of working for the public school system, had a few pints together. Our friendship has weathered the kinds of career and life changes that seem to arise relentlessly in mid-life. Graham is one of the most unique people I know: he’s broadly cultured yet down-to-earth, a dedicated and gifted teacher, musician, DJ, mechanic, it seems like he can fix anything and he and Nettie are always involved in some new project. The theater was free the week of Halloween, Michael and I went to check it out, and we ended up booking it for the entire week, with the idea of having a couple of days to do tech and dress rehearsals, and then a few shows. And in fact this is exactly what we did. Venue secured, check! This was the first and only musical project that we’ve had at The Barbershop Theater since we opened in June 2018. It was wonderful to have Walter (who has been one of my closest friends since we both moved to Nashville 15 years ago) playing one of my favorite albums at our new venue. The band was incredible, and the light show and animation made the whole event more of a theatrical production than just a show. It felt like having a family reunion night after night, and is one of my favorite memories at the Barbershop this year. Our next challenge was to figure out what personnel we would need, find them, and get them to commit. (Remember, this project was something we were doing for fun.) Luckily, The Dark Side of the Moon is beloved by many people, and the opportunity to be involved in a performance of the entire work is something hard to resist for a lot of rock musicians. We didn’t have to twist any arms. 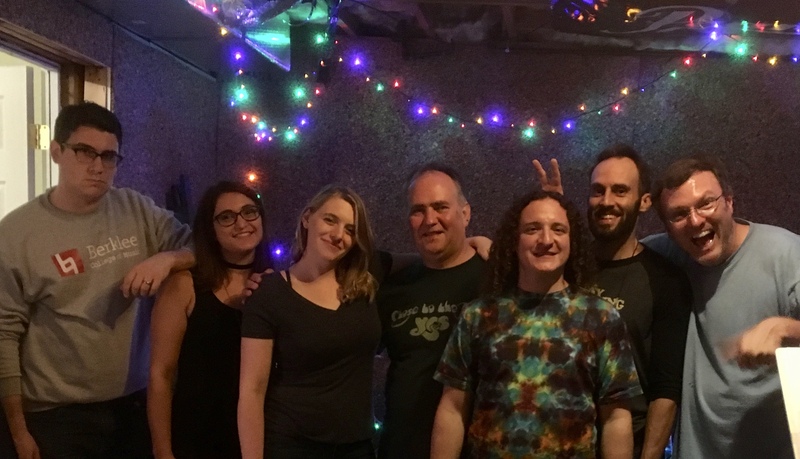 The Forest rehearsal, September 14, 2018 (l to r) WB, Danesa, Kate, Michael, Alex. I spent a lot of time in May, June, and July listening to the original album and researching how Pink Floyd performed DSOTM themselves. 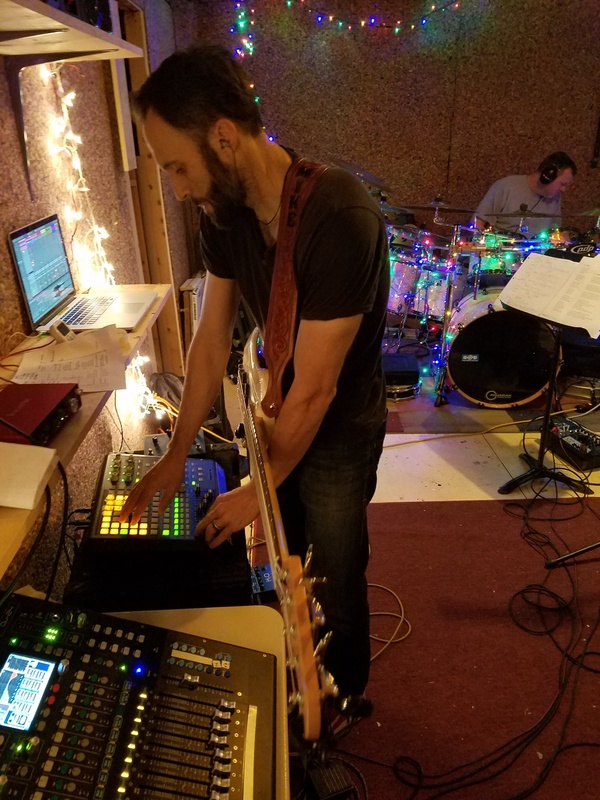 There are many elements of the work created in the studio that are difficult to replicate on stage, and it seemed best to take our cues about how to go about crafting a live performance from the band themselves. Our idea was to both be faithful to the original album in style and spirit, and to find a way to make the performance our own. In the end we used two recorded documents to craft our show: the original 1973 album, and a live recording at the Empire Pool from Pink Floyd’s 1974 UK tour. The Forest’s performance of DSOTM featured elements unique to both of these recordings. Deciding on what instrumental and vocal forces we would need was the first step, and once this became clear Michael and I were able to quickly recruit musicians willing to participate in the show. Between the two of us – Michael with his experience and connections from the bands he has played with, and my network in the musical and creative community – we were able to fill out the band. Michael knew Alex, Andrew, and Eric and had played with each of them in various projects; Alex is married to Kate (they met at Berklee College of Music when they were both students there) and incidentally she was the only member of the band who had participated in a DSOTM project before; I knew Ryan, who is Director of Jazz Studies at Blair School of Music (we have collaborated on concert projects before) and Danesa, who sung in my choir program at Nashville School of the Arts. Like many bands, a network of personal relationships brought us together, and a vital component of these relationships was friendship. Michael approached me at my wedding as I was making my way to thank guests. He asked if I would consider playing guitar in this Dark Side of the Moon project he wanted to put together. After little thought, I replied, “I think there’s other guys around town who might be better equipped to pull that off.” He didn’t push. It was my wedding after all. About two weeks later, Michael called me and for the second time, pleaded his case. This time, he was puttin’ the moves on. It occurred to me about halfway through that conversation that there appeared to be no plan B at guitar. It was me or it was nobody. And they’d already booked the venue and the dates. I couldn’t leave my friend hangin. So I said yes. And I’m glad I did. From the very beginning we had the idea that the show would incorporate visual elements. Pink Floyd used lighting and visuals from their very early psychedelic shows in the late 1960s that developed into the legendary extravagance of arena shows like The Wall (1979). It seemed unthinkable to try to perform DSOTM without including a visual accompaniment, and my idea was to find a local artist who would work with us on the project and present his or her original interpretation as part of The Forest‘s show. But at first I had no idea who it would be – I thought about former students working in digital and multimedia but was uncertain who to contact. One night in early June I woke up around 2 am and thought “call Brian Hull“. Kari Leigh Ames & Brian Hull at The Barbershop Theater, August 17, 2018. 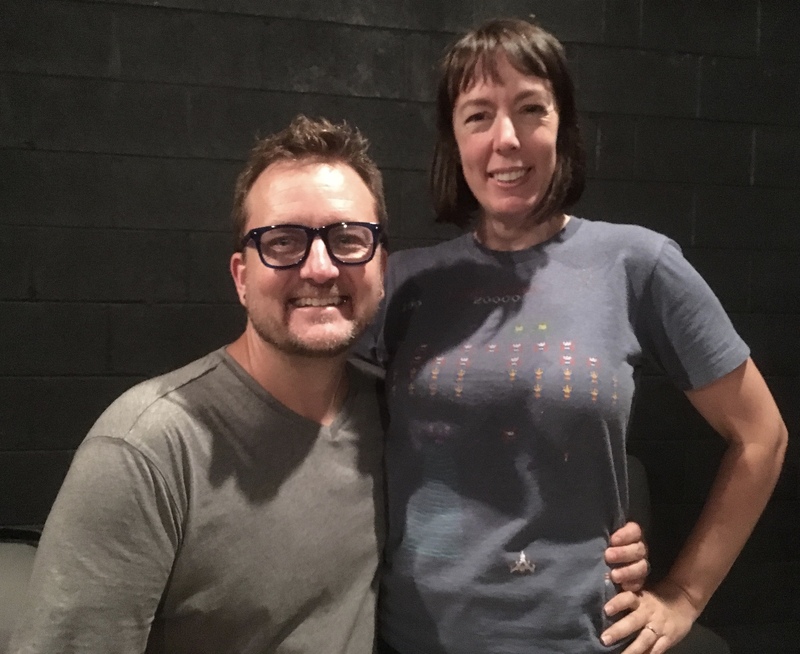 Brian is one of the most creative people I know – he is the director of Wishing Chair Productions, the puppet theatre at the downtown Nashville public library, which is renowned nationally in puppetry circles. 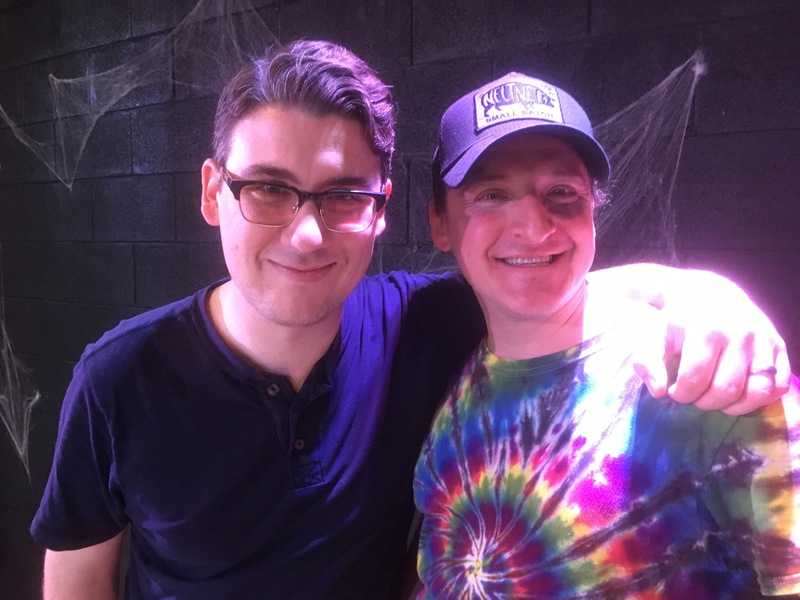 He also writes and produces shows for Dollywood, has performed his award-winning show Kaytek the Wizard all over the country, and is in general a restlessly creative and amazing person. 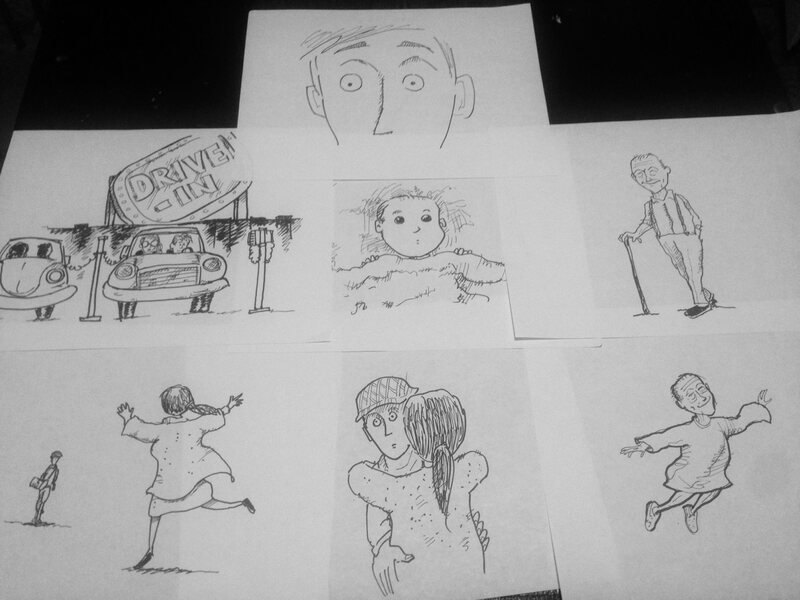 He’s a writer and visual artist, an animator, an actor, a trained opera singer. I’ve known Brian for fifteen years (our sons went to elementary school together: they are now both professional musicians in their mid-twenties) and although we’ve collaborated together on family shows at the symphony before, we’ve never done a creative project before just as independent artists. So I called him the next day, we managed to get together for lunch a couple weeks later, and like that! he was in. 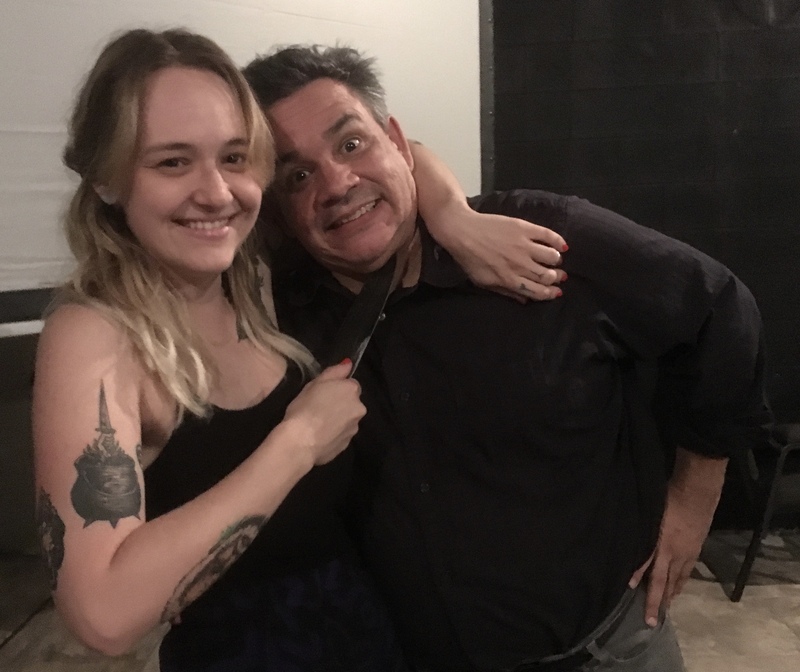 I can honestly and sincerely say that this show was a complete blast from beginning to end; when Walter called me about it I committed immediately. We were trusted to do whatever it is we do – and that is my favorite way to work and create. I look forward to the next one!! It was through Brian that I met Kari Leigh Ames. Kari works with Brian on Wishing Chair productions and is yet another Nashville one-of-a-kind creative. 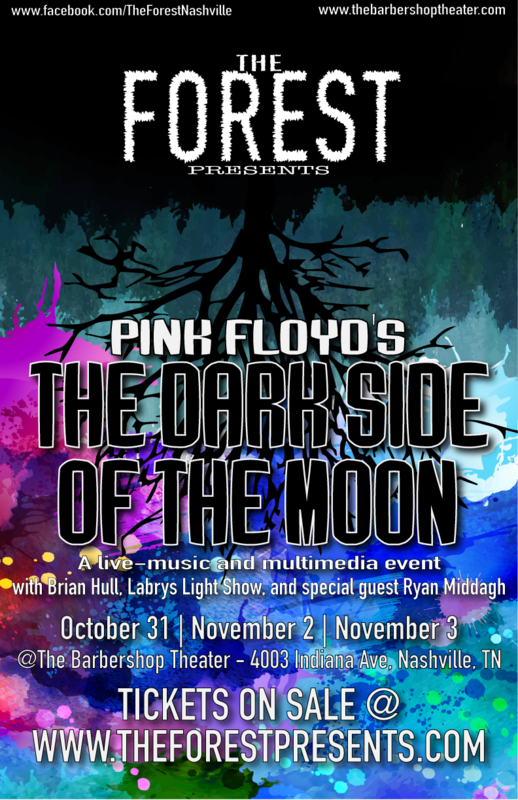 She’s the co-founder of Far Out Nashville – our city’s annual psychedelic festival, coming up on their third season this year – and the founder of Labrys Light Show. Kari’s participation in The Forest was under the Labrys Light Show umbrella, and her unique, beautiful, and mesmerizing liquid light show added an immersive and compelling element to Brian’s animation, and to the show as a whole. After many hours spent listening to DSOTM and working out a clear map of how The Forest would perform it, I sat down in July to write out my understanding of what the album is actually about – in words – as well as its artistic, cultural, and historical significance, as a means to bring all ten of us together towards a unified vision of the work we would be presenting to the public. Brian and Kari were not present at band rehearsals, and Brian especially, who was working on an original visual presentation with hundreds of images, had expressed the wish for some alignment in his choice of content. So I sat down to write what I initially imagined would be a “one page” outline of the main themes of the album. 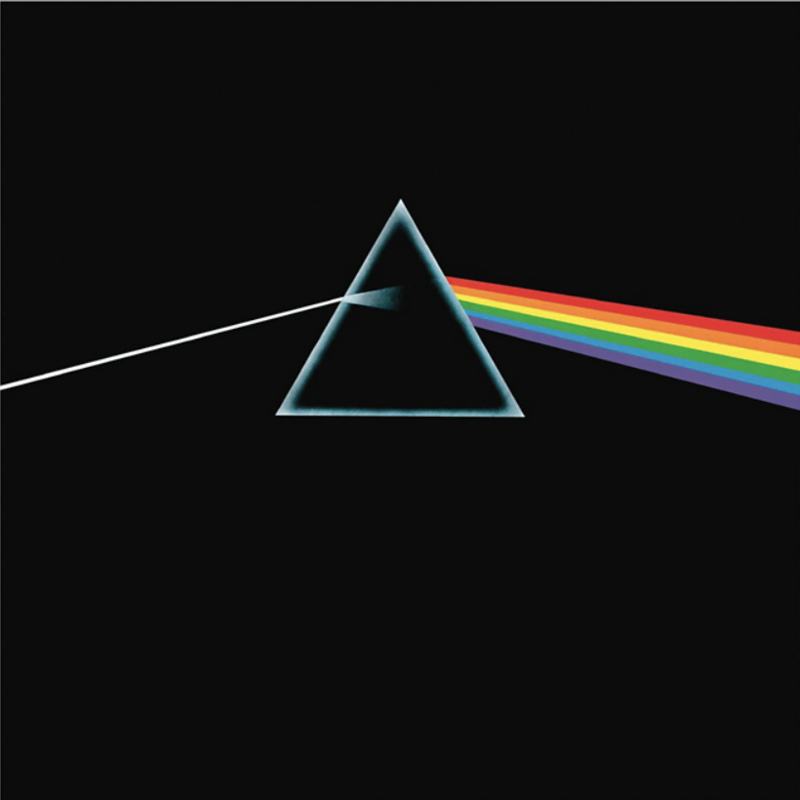 What I ended up with, however, was a robust essay On The Dark Side of the Moon that I then published in three parts here on Off The Podium (for those interested, here’s the first part). By walterbitner in Community, Music, Rock on January 18, 2019 . Another creative, crazy and wonderful escapade by Walter Bitner! I’m in awe of your chutzpah and sense of fun. The blog post’s a great read as well. Cheers!